Introduction: This Grade 6 Earth Science Plate Tectonics Unit focuses on plate tectonics and addresses the California Science Standards for 6th grade for the topic of plate tectonics and Investigation and Experimentation. By the end of the unit students will know: Plate tectonics accounts for important features of the Earth’s surface and major geological events. Evidence for plate tectonics is derived from the fit of continents; the location of earthquakes, and midocean ridges; and distribution of fossils, rock types, and ancient climatic zones. The Earth is composed of several layers: a cold, brittle lithosphere, a hot, convecting mantle; and a dense, metallic core. These layers have different densities, compositions and temperatures (energy). Lithospheric plates the size of continents and oceans move at rates of centimeters per year responding to convection currents in the mantle. Geologic events, such as earthquakes and mountain building, result from movement of the plates. Earthquakes are sudden motions along the breaks in the crust called faults and that volcanoes and fissures are locations where magma reaches the surface. Epicenters of earthquake can be determined. The effects of the earthquake on any region varies, depends on the size of the earthquake, the distance of the region from the epicenter, the local geology, and the type of construction in the region. Every plate boundary is a dynamic place resulting in changes to the earth’s surface. Mountains and sea floor trenches can be explained if you understand the possible combinations of crust movement at the boundaries. When two continental plates collide, large mountain ranges (like the Himilaya) are formed. Because an oceanic plate will subduct, deep sea trenches result. Even transform boundaries involve great pressure that can alter land formations and result in small mountain ranges. Major features of California geology, including the Channel Islands, are the result of plate tectonics. The Grade 6 Earth Science Unit on Plate Tectonics is presented to students through a series of investigations using indirect evidence (models) and direct evidence, experiments, active learning experiences, researching using a variety of sources, questions, and assessments. Assessments include: pre-, post- and 4 formative assessments. Conceptual Flow Narrative: The Grade 6 Conceptual Flow Narrative for Earth Science: Plate Tectonics builds on the concepts presented on the conceptual flow graphic by describing the concept(s) addressed in each lesson and the links that connect each lesson to the next. Lessons are linked to the previous lesson and the lesson that follows via a conceptual storyline to enable the development of student understanding as they progress from one concept to the next. After students have completed the Pre-Assessment, they begin their exploration of plate tectonics with Lesson 1, “Densities’ Effect on Layers” which includes three linked sessions building the concept that density determines the order of layering of earth materials. During the first session, students study pictures of the Grand Canyon to raise the question of why Earth materials are in layers on canyon walls. 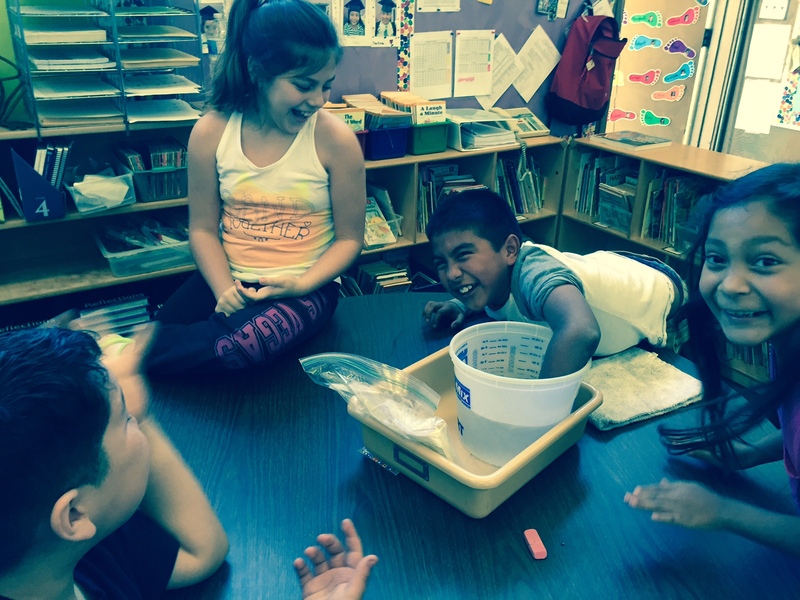 Students observe a model with sediments sinking, floating, or suspending in a liquid. The second session deepens the exploration of how different materials sink or float using the model of diet and regular coke. The third session focuses on relative density through a student exploration of building models with different densities. Students apply concepts of density to explain the layers of Earth materials visible in the Grand Canyon pictures. In the previous lesson students learned that density of materials determines order of layers. Lesson 2, “Layers of the Earth” includes six sessions establishing how indirect (models) and direct lines of evidence are used to understand that different layers have different densities, compositions, and temperatures (energy). The first session begins with a video exploration showing different layers of the Earth. During session two, students explore how two different models of the Earth represent layers (M&M) and scale (playground). Session three develops an understanding of how indirect evidence is used to build accurate models of the interior of the Earth. Session four demonstrates using a cupcake model of core samples how direct evidence builds knowledge of the top of the crust. Session five uses cooperative groups to research text information about layers of the Earth. The densest layer, the core, is at the center. It is solid on the inside and liquid on the outside. This layer is so dense it produces intense heat. The next middle layer, the mantle, also has two parts like the core. Its outer layer the asthenosphere (mantle) can flow like a liquid. The least dense layer, the lithosphere, floats on the asthenosphere (mantle). The lithosphere is not all one piece. It is composed of large sections called plates that are continually moving. The top of the lithosphere is the crust where we live. In session six, students summarize their learning about Earth layers in a “layer book”. Lesson 3, “Convection Currents in the Mantle,” links the exploration of Earth layers from lesson 2 to what causes movement in the layers. Students use convection models to explore how fluids or semi-fluids such as the mantle transfer heat. The model is used to show how the hotter, less dense mantle rises towards the surface where it cools, becomes more dense and sinks back toward the center of the Earth. These convection currents in the mantle constantly and slowly move the plates around. Formative Assessment #2 is adding the explanation that convection causes movement of the upper level of the mantle and the lower level of the crust. This continuous movement within the mantle causes changes in the crust. In Lesson 4, “Continental Drift,” students link lesson 3 concept of convection current to changes in the Earth’s crust from one super-continent to present day forms. Evidence on different continents including similar land forms, fossils from similar geologic periods and climatic features such as evidence from glaciers pointed to the super continent Pangaea, followed by millions of years of “Drifting Continents”. Students explore with a newspaper puzzle model explaining how scientists piece together evidence showing continental movement. Wegener’s multiple lines of evidence for continental drift is explored through a “readers theater” bringing a voice to the developing theory. The culminating exploration develops a prediction of where plates will be in 50 million years based on the plate movement from the past 200 million years. Having learned that continents have moved and are continuing to move in Lesson 4, students in Lesson 5 “Seismic News” explore evidence that years of earthquake records started to give shape to plate boundaries. Students use Internet data to plot current earthquake activity discovering patterns of seismic activity at plate boundaries. Discussions of current earthquakes leads to understanding varying factors that cause damage to structures. Lesson 6 “Sea Floor Spread” deepens understanding that the evidence from the sea floor- including drilling samples, molten materials and the age of the rock itself, provided the final piece of the puzzle explaining the guiding theory of earth sciences: Plate Tectonics. Students build sea floor models showing ages of the rock combined with a written assignment explaining sea floor spread to parents. Formative Assessment #3: “Continental Drift and Sea Floor Spread” assesses concepts in lessons 4,5, and 6 that link Wegener’s evidence for continental drift with added evidence of sea floor spread to the growing support for Plate Tectonic theory. Sea floor evidence provided the final data needed to explain plate movement. While lesson 6 established the final piece of evidence (sea floor spread) for continental drift, Lesson 7, “ Plate Tectonics” includes explorations of different types of movement depending on the density of materials at plate boundaries. Types of boundaries include transform, transverse, and convergent boundaries and result in different landforms. Students map plates and demonstrate understanding of different types of boundaries. Identifying different types of movements at plate boundaries in the previous lesson are linked to measuring plate movement in Lesson 8 “Dynamic Planet”. Students become experts at the speed and velocity of one piece of 18 individual pieces of the planet (crust). All students in the class collaborate using a process to assemble 18 pieces of the crust into a whole. Arrows and velocities are used to indicate speed and direction of movement. Having experienced the world view of plate movement in lesson 8, students are able to bring plate movement connections to how local land was formed in Lesson 9, “Channel Island Tectonics” Students use a combination of video explanations and evidence from types of rocks and magnetic direction to construct a model of the Channel Islands’ movement. Understanding the formation of the Channel Islands in lesson 9 leads to explorations of mountain formation in Lesson 10, “Mountain Building”. When two continental plates converge or collide (convergent boundary), large mountain ranges form (Himalaya). Transform boundaries do not collide but involve great pressure that can alter land formations and result in small mountain ranges. Divergent plates on land result in rift valleys and in the ocean become a mid- oceanic ridge with new sea floor. The lesson continues to use models to explore different land formations at plate boundaries. Formative Assessment #4: “Fault Line Performance Assessment” provides an opportunity for students to explain what they know about California landforms and movement along plates. The assessment includes; directions, task, and rubric for scoring. In the previous lesson and performance assessment, students learned that different landforms develop on plate boundaries. Lesson 11 “Density of Granite and Basalt” returns students to how relative density of material (rocks) can predict how a dense oceanic plate will subduct under a less dense continental plate. Students explore the relative density of granite and basalt. When the two rock forms meet at a boundary the more dense basalt subducts. Upon completion of the 11 lessons, students take a Post-Assessment to determine their overall understanding of the concepts presented in the unit. Hi. I attended the CSTA conference in Palm Springs and learned about your resources. I will be teaching the plate tectonics unit when we return from winter break. I am unable to access lesson 6.1 (Density affect on layers). Is there any way you can check out the link? Thank you so much for sharing your resources! They are incredible! Thanks for generously sharing your resources. I’m looking forward to integrating your efforts/materials with what I’ve been collecting these last few years.